Acetaminophen and Codeine Overdose is the excessive intake of one or more medications containing acetaminophen and codeine, intentionally or by accident. What is Acetaminophen and Codeine Overdose? What are the Causes of Acetaminophen and Codeine Overdose? What are the Signs and Symptoms of Acetaminophen and Codeine Overdose? The signs and symptoms of Acetaminophen and Codeine Overdose can vary from one individual to another. It may be mild in some and severe in others. Several systems of the body, such as the respiratory system, digestive system, nervous system, vascular system, urinary system, and skin may be affected. How is First Aid administered for Acetaminophen and Codeine Overdose? Note: The antidote NAC is administered to prevent liver damage, if treatment is started within 8 hours of overdose. NAC is administered orally or through an intravenous line. Intravenous administration is generally preferred over oral administration in patients with acute liver failure. Who should administer First Aid for Acetaminophen and Codeine Overdose? 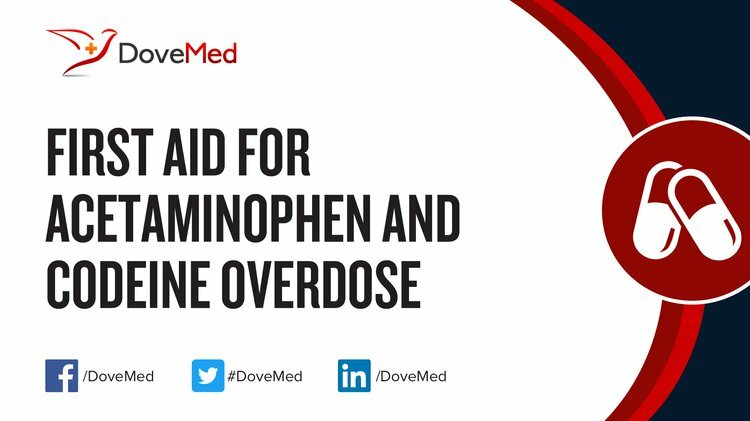 First aid for Acetaminophen and Codeine Overdose is administered by healthcare professionals. What is the Prognosis of Acetaminophen and Codeine Overdose? The prognosis is dependent on the dosage of acetaminophen and codeine taken, time from overdose to start of treatment, severity of the symptoms, and general health and liver function of the patient. How can Acetaminophen and Codeine Overdose be Prevented? Kelly, L. E., Rieder, M., van den Anker, J., Malkin, B., Ross, C., Neely, M. N., ... & Koren, G. (2012). More codeine fatalities after tonsillectomy in North American children. Pediatrics, 129(5), e1343-e1347. Zedler, B., Xie, L., Wang, L., Joyce, A., Vick, C., Kariburyo, F., ... & Murrelle, L. (2014). Risk factors for serious prescription opioid-related toxicity or overdose among Veterans Health Administration patients. Pain medicine, 15(11), 1911-1929. Ong, C. K., Seymour, R. A., Lirk, P., & Merry, A. F. (2010). Combining paracetamol (acetaminophen) with nonsteroidal antiinflammatory drugs: a qualitative systematic review of analgesic efficacy for acute postoperative pain. Anesthesia & Analgesia, 110(4), 1170-1179. Babaei, A., Dehdashti, A., Afrasiabi, M., Babazadeh, M., Farshbaf, M., & Bamdad, F. (2012). A sensor for simultaneous determination of acetaminophen and codeine at glassy carbon electrode modified with multi-walled carbon nanotubes. Sensor Letters, 10(3-4), 1039-1046. Yellon, R. F., Kenna, M. A., Cladis, F. P., Mcghee, W., & Davis, P. J. (2014). What is the best non‐codeine postadenotonsillectomy pain management for children?. The Laryngoscope, 124(8), 1737-1738. Dear, J. W., Antoine, D. J., Starkey‐Lewis, P., Goldring, C. E., & Park, B. K. (2014). Early detection of paracetamol toxicity using circulating liver microRNA and markers of cell necrosis. British journal of clinical pharmacology, 77(5), 904-905. Yorgason, J. G., Kalinec, G. M., Luxford, W. M., Warren, F. M., & Kalinec, F. (2010). Acetaminophen ototoxicity after acetaminophen/hydrocodone abuse: evidence from two parallel in vitro mouse models. Otolaryngology—Head and Neck Surgery, 142(6), 814-819. Sinyor, M., Howlett, A., Cheung, A. H., & Schaffer, A. (2012). Substances used in completed suicide by overdose in Toronto: an observational study of coroner's data. The Canadian Journal of Psychiatry, 57(3), 184-191. Anderson, B. J. (2013). Is it farewell to codeine?. Archives of disease in childhood, archdischild-2013.